Novo Kazalište, Zagreb and Cankarjev dom, Ljubljana’s co-production of Heiner Müller’s “adaptation” of Macbeth is something of a puzzle. And the puzzle is this: the reason that this is Müller’s “adaptation” or *version* of Macbeth doesn’t come from the playwright’s 30-year-obsession with the play and “desire to destroy it”, as it does with Hamletmaschine. It simply comes from the fact that the play is written in English and Müller was directing it in German. To this end, he simply made a translation and several edits. Edits of much the same sort that any British director doing the play might make. Müller’s big thing is apparently the de-witchification of the play. He worried that the witches spell pre-determinism, and wanted his version of Macbeth to reflect instead the endless cycle of violence begetting violence, and how this is initiated by a ruling class, mostly at the expense of the lives of their working class soldiers. “The piece offers no utopian belief in a revolution that might change the world” the programme concludes. I think I’m right in saying that he has also wordlessly inserted a final moment at the end, where, having killed Macbeth, McDuff hails Malcolm as King, and Malcolm promptly has him killed; echoes of Stalin’s way of periodically killing off all those who in his inner circle who had got closest to him, as they presented the clearest successional challenge to his absolute authority. It’s a sharp point and a nice invention, but not more so, really, than Sam Mendes’s idea of having Lear batter his Fool to death in his recent NT production. The puzzle, then, is why a Slovenian company, working almost two decades after Müller’s death, would choose to stage (faithfully, I assume) a version of a German translation of an English play, rather than simply translate the play for themselves and make exactly the version they need/want. Ivica Buljan’s production makes an incredibly strong and clear case for the reasons. What’s most fascinating about this staging (and, I have to say, because it was in Slovenian, I have no idea of the extent to which Müller “adapted” Shakespeare’s actual lines) is the way in which, just as Müller de-Shakespeared Shakespeare, Buljan re-Shakespeares Müller. Or at least, the text is played the least like any staging of Heiner Müller I have ever seen, and at the same time makes a pretty recognisable Macbeth. Of course, part of this comes from the fact that the text is no longer in German. Even when translated into English, Müller’s poetry retains a certain chilly rigidity. Rendered into Slovenian, it gains a violence and heat that I’ve never heard in his work before. As with Damned Be The Traitor of His Homeland (also Slovenians directed by a Croatian, interestingly) you notice the capacity for the Slovenian language to sustain violent outbursts, or prolonged shouting, in ways that English (or Portuguese, I’d say) simply doesn’t. Added to this is – again, particularly noticeable in the wake of Damned... – the enviable physicality of the performers. It’s also fascinating to see this production of Buljan’s *after* the arguably unsuccessful experiment of having him transpose his working methods onto a Portuguese cast. Here, with a comparatively local cast (sorry, I honestly don’t know enough about the differences in performance styles between ex-Yugoslav countries to be able to make any useful comparison between Croatian and Slovenian actors), his aesthetic really flies. The piece is played in-the-round, a format which I pretty much detest. Here, “the round” is made up of white plastic beach/garden chairs, forming a relatively small square stage in the middle of Incrível de Almadense’s much larger auditorium (one which, ordinarily, would be dominated by the large pros. arch stage that I’ve got my back to). The two tiers of balconies and the stage are all made use of, raced round, stamped on, climbed up and sung from, but the real meat of the relentless, kinetic action takes place on the floor right in front of us – “off-stage” for the cast are several front row chairs with “reserved” signs sellotaped to them; they even do their costume changes sat there. And I loved it. This is the most violent, physical, pounding Macbeth I’ve ever seen (and the third foreign one I’ve seen in a row – previously: Poland and Germany – Rupert Goold’s “proper” Stalin-era West End one with Patrick Stewart seems but a distant memory now). It opens with the whole cast (minus Lady Macbeth – Milena Zupančič, 67) in combat trousers and vests (an old aesthetic, but one seldom pulled off as convincingly as here – if anything this company looks more credible as fighting unit of irregulars than of actors; not the skinny, pampered, vain thing you usually see when British companies try it) basically fighting each other. Like, really. (Apparently after this performance one actor actually was hospitalised. I’m not really surprised. None of the fighting is fake, or even choreographed as far as I could see). 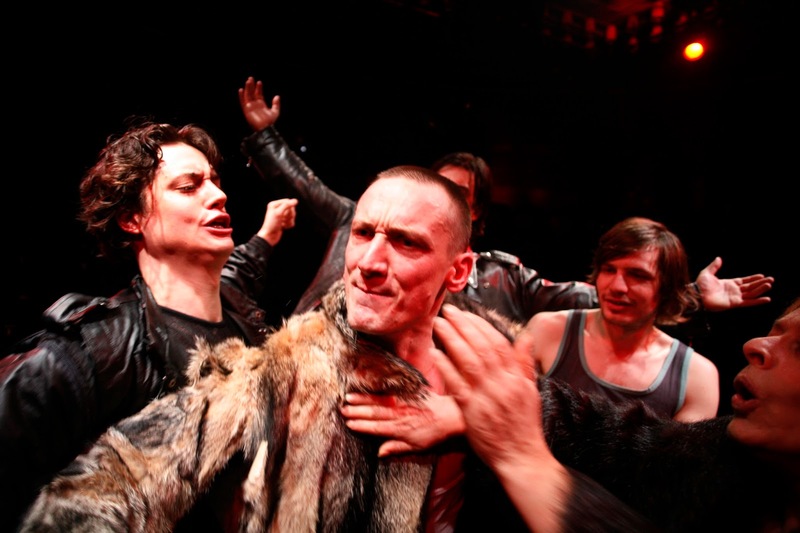 It’s established that Macbeth has won, Duncan is pleased, and the scene shifts into a stage bathed in red light and the men all kinda getting it on. As with Macbeth’s wife being played by an actress old enough to be his mother (just about), I have literally no idea what this homo-erotica intended to signify. Most likely a kind of Spartan/Athenian warrior society where men have wives, but also seem pretty comfy with bloke-to-bloke action. Other tropes are more legible. Like Damned... it has a sequence in which corpses dressed only in their pants are dragged by their arms into a line, like a line of so many ribcages, recalling not only photos from Auschwitz, but also of those mass graves, or not-even-graves, in ex-Yugoslavia. Similarly, the point where Macbeth seems to be graphically gang-raped by soldiers also feels horribly familiar from stories coming from the ex-Yugoslav conflicts. The banquet at which Banquo’s ghost appears (oh yes, they’ve de-witched, but there are still ghosts), has turned into a violent turbo-folk charged vodka or slivovec (or is it šljivovica?) party. So, without ever feeling like it’s labouring a point, Buljan’s production here feels like it at once presents as effective a Macbeth as you’re ever likely to see, and at the same time drags it, horrifyingly into the recent present conjuring the ghosts and still-present horrors of the ex-Yugoslavian conflicts. And, at once honours both Shakespeare and his interpreter and theoirst, Müller. I imagine some of my ex-Yugoslavian and Eastern-European friends might find/have found this production a little “normal”. And, without wanting to disparage British Shakespeare – which is pretty much an entirely different creature – if this was our baseline for “a bit ordinary” that would be no bad thing either.